These pistons are manufactured for race use so are more than adequate for any application, allowing up to 13.5:1 CR to be used (with suitably altered distributor advance curve). 6.5cc dish. Other over-sizes available (CST3030-73.0 and -73.5). 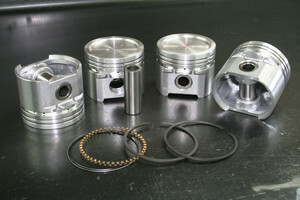 Sets come complete with piston rings and standard 0.812” diameter wrist pins. Pin to crown height is 1.5276" as per A+ high compression pistons. Weight including rings and pin 378 grams.